Beautifully engraved unissued certificate from the E.A. Wright Banknote . This historic document was printed by the E.A. 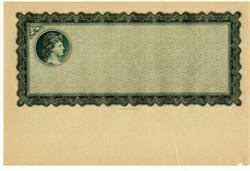 Wright Banknote Company and has an ornate border around it with a vignette of an allegorical woman's head. This item is over 75 years old. Small cut in lower right corner as seen in scan, not affecting printed border.